One of the Architect of the Capitol's (AOC) strategic goals is to foster an innovative and empowered workforce. Achieving this goal will ensure that AOC staff will exercise greater responsibility for performance, proactively apply well-informed judgement and innovation, to solve problems with solutions that focus on results. What does an empowered and innovative workforce look like in day-to-day operations at the AOC? Earlier this summer, a water leak in the Rayburn House Office Building resulted in water pouring down a shaft containing a bus duct. In electrical power distribution, a bus duct is a sheet metal duct containing copper or aluminum conductors in a generating or receiving station on which power is concentrated for distribution. To say the least, water in this area created a potentially dangerous situation, and caused electricians to think about possible improvements. Electricians working in the House Office Buildings, Charles "Buddy" Greenwell, Rick Hazzard and Frank Anastasi, developed the idea of creating water dams around shaft openings. Coordinating with the Masons shop, a brick barrier was constructed to minimize water from entering areas containing electric bus ducts. Sharing this innovative solution with colleagues resulted in the Cannon Renewal Project to incorporate a similar solution for pipe shafts in the current building restoration. 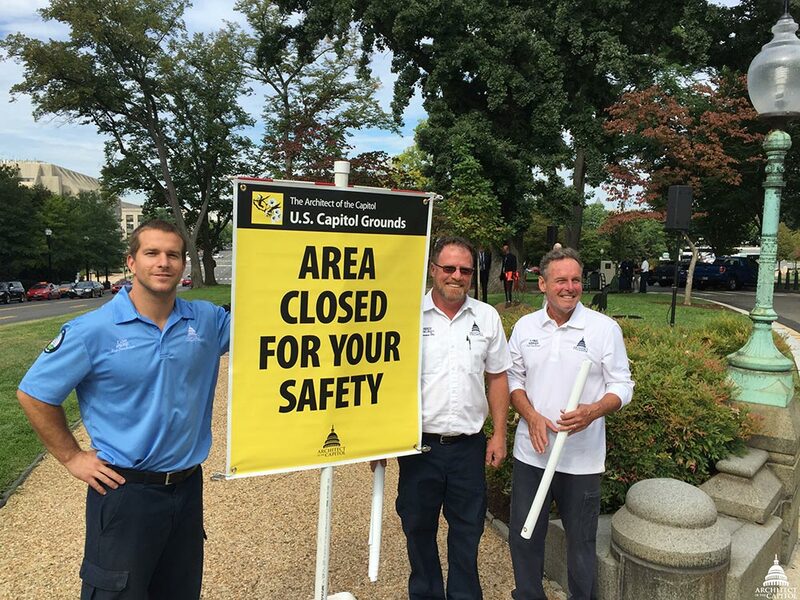 The Capitol Grounds team also displays its pioneering spirit to ensure safety around their worksites. Often, as is the nature of Capitol Grounds projects, select outdoor areas including sidewalks and lawns must be closed for the safety of visitors and staff on Capitol Hill. Interested in ensuring that their workspace was not inadvertently entered, the team researched warning sign display options and found them to be costly and, in many cases, not strong enough to withstand day-to-day operations. Never a group to give up, the team created an inexpensive solution: sturdy, self-contained frames that hold a variety of signs designed by the agency's communications office. The signs are made of weatherproof material and display at eye-level, making them easier to see and inform the public about the work being done. The frames are created using PVC pipe and hooks. The entire assembly can be displayed and removed quickly. The sign, hooks and brackets are stored inside of the center PVC pipe and can be easily staged in a closet or tossed in the back of a truck until needed. 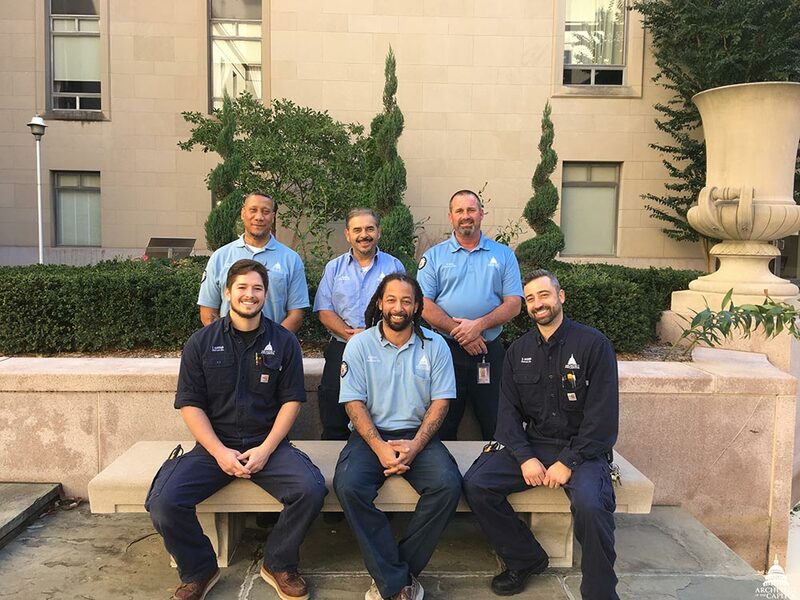 These two teams are just a few of the many exceptional employees who are acclaimed for their talents and recognized as trusted stewards of the buildings and grounds on the Capitol campus. It is always the skilled tradesmen/women that is at the front of problem solving. My skill as a journeyman pipefitter attests to this every day, keep up the work in keeping the capital looking great.